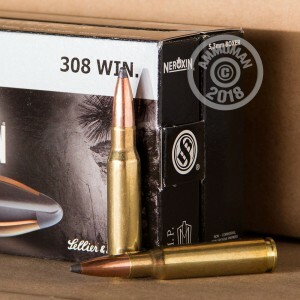 This .30-06 Springfield ammunition from Sellier & Bellot is a fearsome deer hunting load! 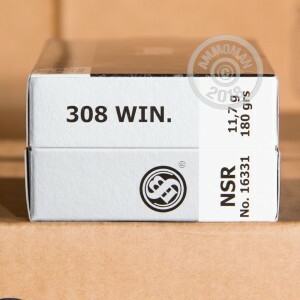 These cartridges fire a 180 grain Nosler Partition soft point bullet that delivers dependable expansion for quick takedowns of deer and other game. The Nosler Partition bullet is the product that launched the famous Nosler bullet company in 1948. It remains a highly competitive design today thanks to its strong weight retention. The Partition gets its name from its dual core construction, which incorporates a copper barrier about 2/3rds down the length of the projectile. This enhances the round's penetration. The bullet also has a tapered jacket designed to provide consistent expansion by mushrooming uniformly at any velocity. 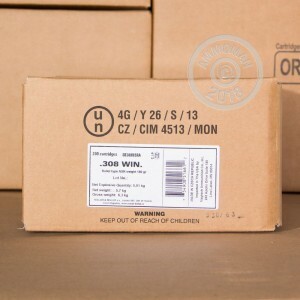 This ammunition is loaded in the Czech Republic using non-corrosive Boxer primers and brass cases.